The sales tax district charged with building and maintaining trails in St. Louis, St. Louis County and St. Charles County is seeking public input on a new regional plan. Great Rivers Greenway is collecting survey responses online and at two open houses to find out how people are using the trails now and how they’d like to use them in the future. 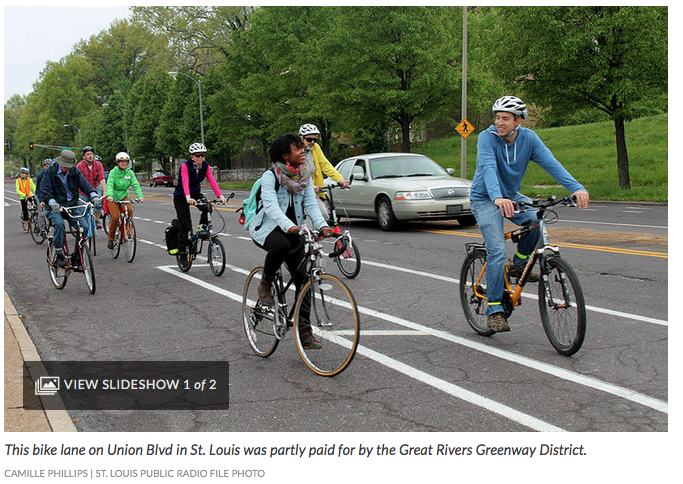 “We really want to make sure that we’re measuring our impact and understanding how and when people are using the greenways to make sure that they have the amenities and the support that they need,” said Emma Klues, communications director for Great Rivers Greenway. While the district’s central vision to build an interconnected “river ring” remains unchanged, Klues said the information will help the district decide where to focus its attention over the next five years. For instance, it might help Great Rivers Greenway decide which of the planned 500 additional miles of trail to build next. The 15-year-old district currently maintains about 110 miles of greenway, but the original vision calls for about 600 miles. Klues said the survey will also help Great Rivers Greenway target its partnerships and fit the amenities it builds with the needs of the people who use each trail. “For instance, some of the greenways are very bicycle heavy and others are very walking focused,” Klues said, adding that trails that see a lot of bikes might benefit from a fix-it station, while a pathway that gets a lot of traffic to and from a Metro station might benefit from a partnership with MetroLink. Great Rivers Greenway’s first open house will be Wednesday, Feb. 17 at the Bridgeton Trails library branch, 3455 McKelvey Rd. The second will be held on Tuesday, Feb. 23 at the Missouri History Museum, 5700 Lindell Blvd. Both open houses will run from 4 p.m. to 7 p.m. with 30-minute presentations at 4:30 p.m. and 6 p.m. Follow Camille Phillips on Twitter: @cmpcamille.